Spring is less than a week away and with it comes wonderful fresh recipes. Don’t get me wrong I love stews, pot roasts and meatloaves as much as the next gal but there is just something magical about fresh spring and summer produce. I think a good salad can taste just as amazing as Traditional Irish Colcannon Potatoes and Cabbage. 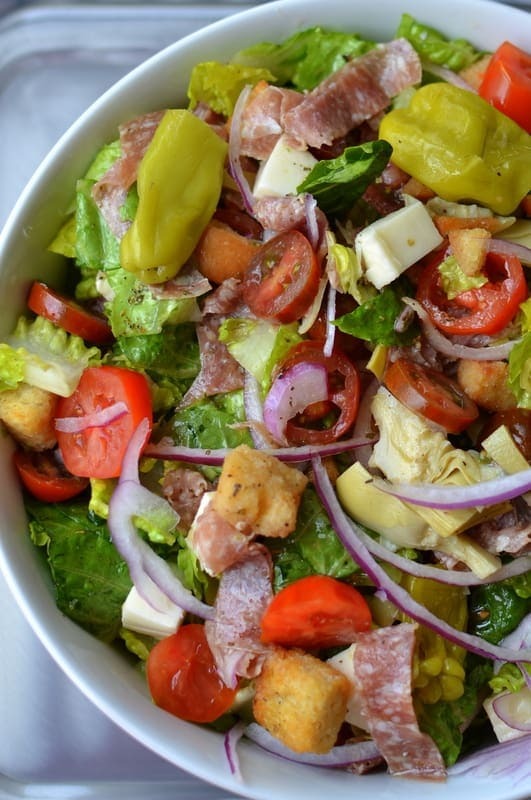 This delicious Italian Chopped Salad with Fresh Italian Dressing makes for an awesome meal and can compete with my Jalapeno Popper Grilled Cheese. The crisp combination of Italian salami, fresh mozzarella, peperoncinis and artichoke hearts is as taste tantalizing as my Crock Pot Chuck Roast and Vegetables. It is just time to move on to fresher, healthier recipes that get our bodies, mind and spirit moving in a super energized way. Just look at how beautiful this Italian Chopped Salad with Fresh Italian Dressing is. 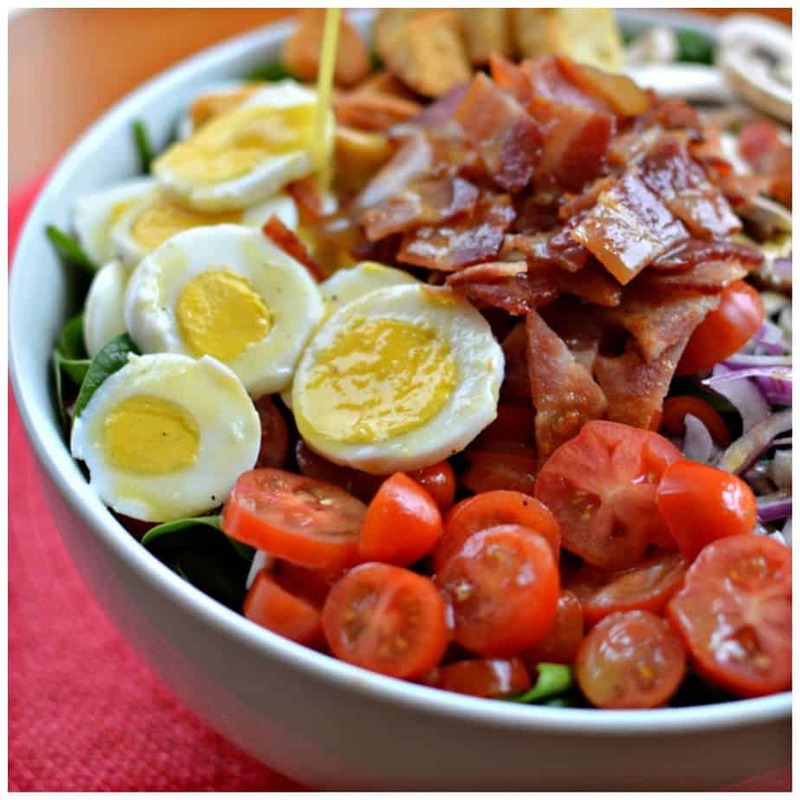 You are going to love all the fresh flavor packed in this super nutritious salad. It is perfect by itself or served with a small bowl of pasta, bowl of soup or Grilled Peperoncini Bacon Tomato Flatbread. It is delicious with this Garlic and Spinach Alfredo Chicken Pasta from Will Cook for Smiles. 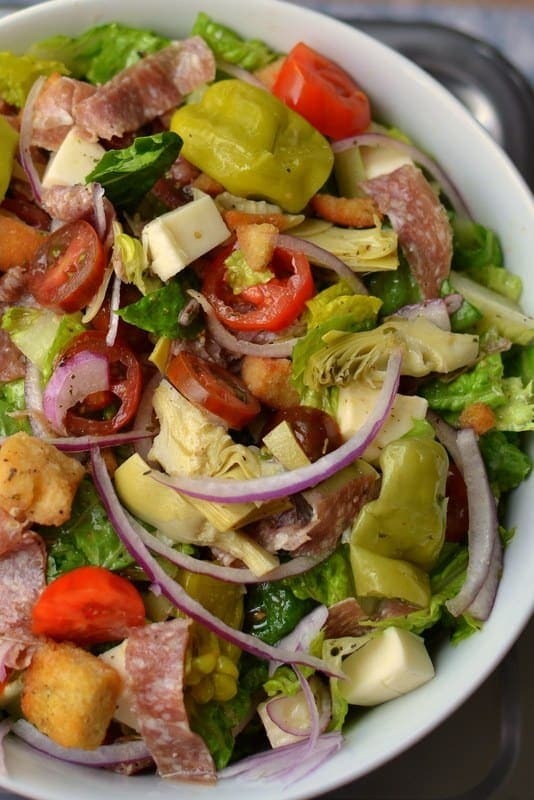 Are you a salad lover? If so let us know what is your favorite salad is in the comments. I love to hear from you. This salad can easily be doubled or tripled for a holiday party, neighborhood soiree, family reunion or potluck. Prepare the dressing ahead of time and save yourself a little bit of inconvenience. Your guests are going to love this and they will be singing your praises. 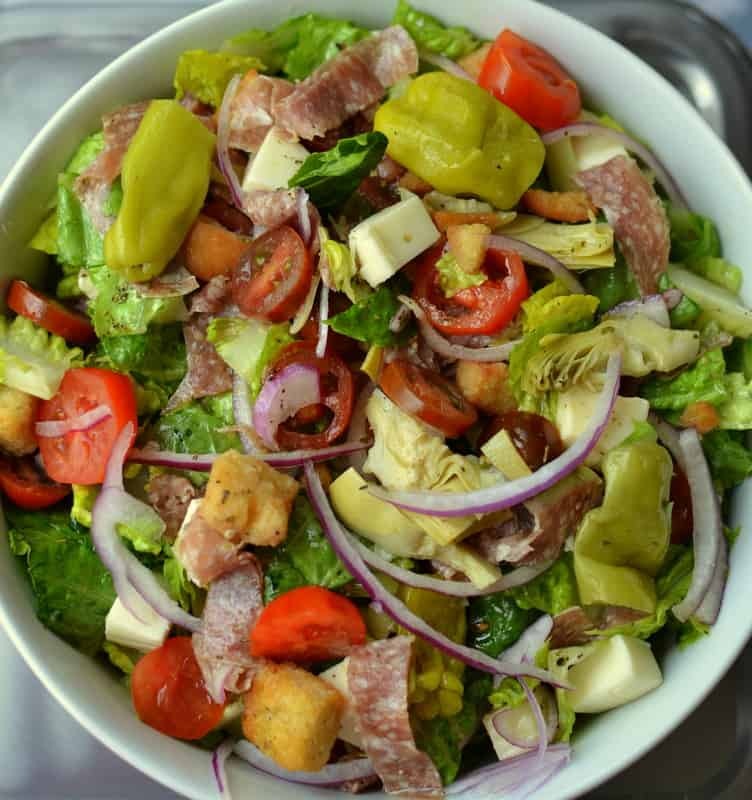 So if you or your loved ones are hungry for a delectable meal that is power packed with plenty of nutrition then put this Italian Chopped Salad with Fresh Italian Dressing on your rotation for the week. In small bowl whisk together red wine vinegar, garlic, sugar, oregano, basil, salt and pepper. Slowly whisk in olive oil. 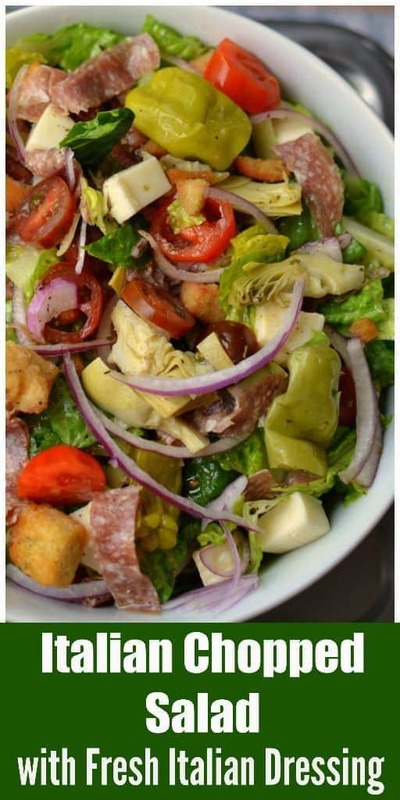 In large bowl combine romaine, grape tomatoes, red onions, peperoncinis, croutons, mozzarella, salami and artichoke hearts. Drizzle with dressing; toss and serve promptly. 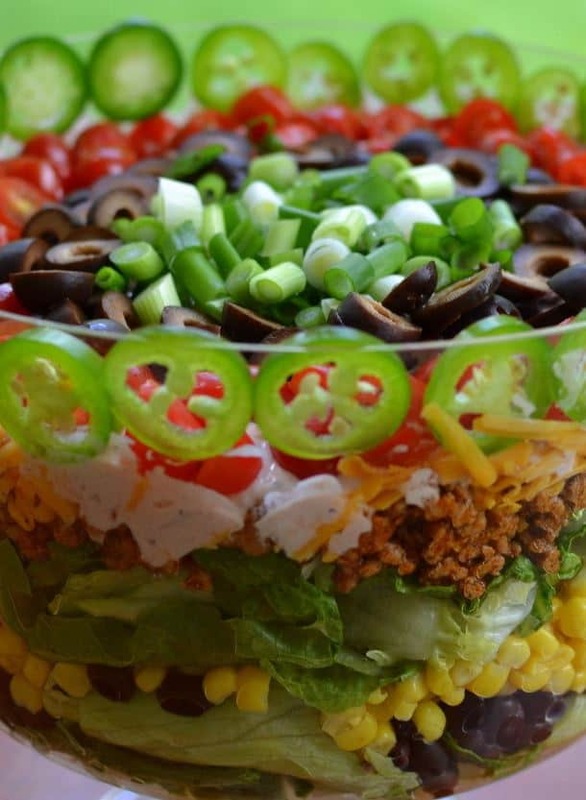 Other salads that you will love!